Motorola announces world's first 5G-upgradable smartphone, the Moto Z3. Today, Verizon and Motorola revealed the Moto Z3 smartphone and 5G moto mod, are coming exclusively to Verizon. 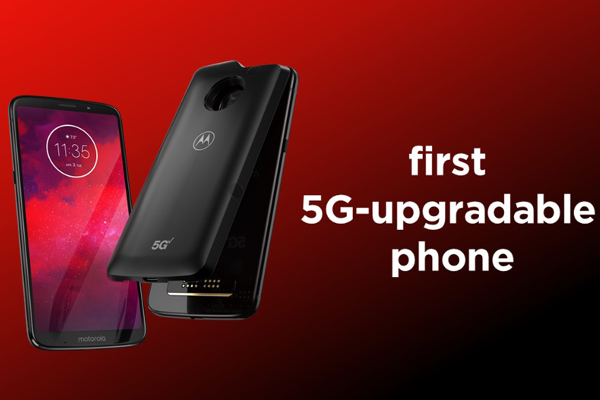 The new Moto Z3 is the first 5G-upgradeable smartphone, which will let you tap into Verizon's 5G network by simply snapping on the 5G moto mod. The new Moto Z3 features a 6" Max Vision Full HD+ OLED display with an expansive 18:9 aspect ratio. Moto Z3 comes with pure Android experience, cutting down on unnecessary apps and bloatware, and including the latest software with Android 8.1 Oreo. It's powered by 2.35GHz octa-core Qualcomm Snapdragon 835 processor with 4GB RAM and 64GB internal storage. The Moto Z3 also includes all the features you love about the Motorola z-series, including all-day 3000mAh battery with TurboPower charging. Moto Z3 sports a dual 12-MP, depth-sensing smart rear cameras that work with Google Lens. There's also a 8 MP front camera that comes with portrait mode, face filters, beautification mode, and wide-angle mode. When paired with the 5G moto mod, Moto Z3 is the world's first smartphone with access to Verizon's 5G Network. Motorola also partnered with Qualcomm to achieve this industry milestone utilizing the flagship Snapdragon X50 modem and millimeter wave components. Battery size: 3000 mAh non-removable Li-Ion, 15W TurboPower charger included, USB-C connector. Wireless charging available with Moto Mod. The Moto Z3 will be available in the U.S. exclusively through Verizon starting on August 16 at $20 a month for 24 months on Verizon's device payment plan ($480 retail; 0% APR). To make it easier to move to 5G once the network becomes available next year, Verizon is offering up to $300 off a new Moto Z3 on device payment plan when you switch to Verizon and trade-in your old phone.